How many commandments are contained in the Ten Commandments? Does that sound like a foolish question? Then consider the fact that thousands of religious people would give an answer like “94” or “110.” You see, there is a strange belief on the part of many that the great God-written law of the Ten Commandments was actually a part of the ceremonial law of Moses which contained scores of specific regulations. They do not see the decalogue as being distinct and totally unique because of its divine authorship. Neither do they see the clear limitation which the Bible sets for this moral code by calling it the TEN Commandments. Is there proof positive in the Scriptures that there was no such blending of the ceremonial and moral law into one? Can it be shown that the Ten Commandments were of a permanent, perpetual nature while the ceremonial law of statutes and ordinances came to an end when Jesus died? Indeed there is abundance of evidence to answer these questions with a resounding yes! God made known this distinction to His servant Moses, and Moses explained it to the people at Mt. Horeb. “And he declared unto you his covenant, which he commanded you to perform, even ten commandments; and he wrote them upon two tables of stone. And the Lord commanded me at that time to teach you statutes and judgments, that ye might do them in the land whither ye go over to possess it” (Deuteronomy 4:13, 14). God answers that important question in such a way that no doubt can remain. “Neither will I make the feet of Israel move any more out of the land which I gave their fathers; only if they will observe to do according to all that I have commanded them and according to all the law that my servant Moses commanded them” (2 Kings 21:8). Here we are assured that the statutes which Moses gave the people were called a “law.” Any child can discern that two different laws are being described. God speaks of the law “I commanded” and also the “law ... Moses commanded.” Unless this truth is understood properly, limitless confusion will result. Daniel was inspired to make the same careful distinction when he prayed for the desolated sanctuary of his scattered nation. “Yea, all Israel have transgressed thy law, even by departing, that they might not obey thy voice; therefore the curse is poured upon us, and the oath that is written in the law of Moses the servant of God, because we have sinned against him” (Daniel 9:11). Once more we see “thy law” and “the law of Moses,” and this time the two are recognized as different in content. There are no curses recorded in the Ten Commandments that God wrote, but the law which Moses wrote contained an abundance of such curses and judgments. No one can confuse this writing with the way the mosaic law was produced. “And Moses wrote this law ... And it came to pass, when Moses had made an end of writing the words of this law in a book, until they were finished, That Moses commanded the Levites, which bare the ark of the covenant of the Lord, saying, Take this book of the law, and put it in the side of the ark of the covenant of the Lord your God, that it may be there for a witness against thee” (Deuteronomy 31:9, 24-26). This book of statutes and judgments which Moses wrote in a book was placed in a pocket on the side of the ark. In contrast, the law written by God on tables of stone was placed inside the ark of the covenant. “And thou shalt put into the ark the testimony which I shall give thee” (Exodus 25:16). At this point we can note several distinctions in the two laws. They had different authors, were written on different material, were placed in different locations and had totally different content. Now let’s take a closer look at the ceremonial ordinances that Moses wrote in the book. They were to repose in the “side of the ark ... for a witness against thee.” It is interesting to note that the curses and judgments of this law spelled out penalties for transgression which were totally missing from the Ten Commandments. For this reason, the ceremonial law was considered to be a law which was “against” them. Even in the New Testament we read the same descriptive language in reference to that law. “Blotting out the handwriting of ordinances that was against us, which was contrary to us, and took it out of the way, nailing it to his cross” (Colossians 2:14). If the Ten-Commandment law had been blotted out at the cross, would Paul have spoken in such glowing language of its perfection and spirituality? He did not speak of a past law. He said, “the law IS holy ... the law IS spiritual.” In other words, it was very much alive and operating when Paul wrote to the Roman church. In contrast he described the handwriting of ordinances in the past tense: “WAS against us ... WAS contrary to us.” It is certain he was not speaking of the same law. One was present and one was past. In the New Testament Church there was a lot of contention over the subject of circumcision, which was a major requirement of the ceremonial law. In Acts 15:5 we read, “But there rose up certain of the sect of the Pharisees which believed, saying, That it was needful to circumcise them, and to command them to keep the law of Moses.” As all recognize, this could not be referring in any sense to the Ten Commandments. They do not even mention circumcision. Yet Paul declared, “Circumcision is nothing, and uncircumcision is nothing, but the keeping of the commandments of God” (1 Corinthians 7:19). If the law dealing with circumcision was now NOTHING (abolished), then what “commandments” was he exalting as being still binding? One would have to be blind not to see two laws here. The moral law remained, while the law of circumcision (ceremonial law) was abolished. The writer of Hebrews spends much time proving that the law of the Levitical priesthood would have to change in order to accommodate the priesthood of Jesus. He did not spring from the tribe of Levi, but from the tribe of Judah. Therefore, we have reference to Jesus “Who is made, not after the law of a carnal commandment, but after the power of an endless life” (Hebrews 7:12,16). The Mosaic Law is never equated with the eternal moral code which operated from the very beginning of human history. Although they were not written down until Mount Sinai, the Ten Commandments were understood and honored by the earliest patriarchs. Even Cain knew that it was a sin to kill, because God told him that “sin lieth at the door” (Genesis 4:7) after he murdered his brother. It is impossible for sin to exist where there is no law. The Bible teaches, “for where no law is, there is no transgression” (Romans 4:15). Again we are told, “Whosoever committeth sin transgresseth also the law: for sin is the transgression of the law” (1 John 3:4). This principle is amplified further by Paul’s statement that “I had not known sin, but by the law: for I had not known lust, except the law had said, Thou shalt not covet” (Romans 7:7). These verses nail down the truth that no sin can be imputed where the Ten-Commandment law is not in effect. God’s statement to Cain about sin lying at the door was in reference to his plan to kill Abel, a violation of one of those commandments. This is absolute proof that the moral law was in effect at that early date. Later, Joseph revealed that he was aware of the binding claims of that same law. He said to Potiphar’s wife, “how then can I do this great wickedness, and sin against God?” (Genesis 39:9). He knew adultery was sin. Abraham was commended by God in these words: “Because that Abraham obeyed my voice, and kept my charge, my commandments, my statutes, and my laws” (Genesis 26:5). It is very obvious that the law which Abraham faithfully obeyed was not the law of Moses, because that law was not given until 430 years later. And we have just established that the Ten Commandments existed before Abraham, condemning even Cain for murder. Neither is it possible for us to conceive that great, godly Abraham was not acquainted with the basic issues of right and wrong contained in the Ten Commandments. It is absolutely certain that another law was added 430 years later, and it was in addition to the one Abraham kept so diligently. “And this I say, that the covenant, that was confirmed before of God in Christ, the law, which was four hundred and thirty years after, cannot disannul, that it should make the promise of none effect” (Galatians 3:17). Can we find further confirmation that this later law was indeed the law of Moses? The answer rests in Galatians 3:19. “Wherefore then serveth the law? It was added because of transgressions till the seed should come to whom the promise was made ...” Here we have two significant facts set forth concerning the law which was added. We are told why it was given and also how long it would remain in effect. These two bits of information will be considered very carefully since they contain compelling evidence in the case. FIRST: WHY WAS IT GIVEN? The verse clearly states that it was “added because of transgressions.” This is most revealing because we have just established that “where no law is, there is no transgression” (Romans 4:15). One can’t be guilty of transgressing a law which does not exist. In this case one law obviously did exist; and it had been “transgressed,” making it necessary to add another law 430 years after God’s covenant with Abraham. And since it is recorded that “Abraham obeyed ... my laws” (Genesis 26:5), we have to believe that that earlier law, which Abraham observed, was the Ten Commandments. Moses had not yet been born, and it could not have been his law. SECOND: HOW LONG DID THIS “ADDED” LAW REMAIN IN EFFECT? The Scripture says, “Till the seed should come.” There is no controversy over the identity of that seed. It is Christ. But do we have evidence that the law which was blotted out and nailed to the cross was indeed the law of Moses? Whichever law it was, it is designated as the “handwriting of ordinances.” Nowhere are the Ten Commandments identified as ordinances. That term is applied to local legal codes which are very narrow and limited, such as “town ordinances” which extend only to the city limits. In comparison, the Ten Commandments are more like the constitution of the United States. WHAT LAW WAS BLOTTED OUT? But let us read the rest of the text before us: “Let no man therefore judge you in meat, or in drink, or in respect of an holyday, or of the new moon, or of the sabbath days: Which are a shadow of things to come; but the body is of Christ” (Colossians 2:16, 17). Question: Could these sabbath days be talking about the Seventh-day Sabbath of the ten-commandment law? No. Because they are clearly defined as “shadows of things to come.” Please keep in mind that the weekly Sabbath was instituted by God before sin came into the world. THERE COULD NEVER BE TYPES OR SHADOWS BEFORE SIN EXISTED! All the shadows were introduced because of sin and pointed forward to the deliverance from sin through Christ. For example, all the lambs slain represented Jesus, the true LAMB, who would die for the sins of the world. If sin had not entered the world, there would have been no need of a Saviour, and therefore, no lambs or shadows pointing to a Saviour. For proof of this, let us go back to the law of Moses and read about these annual feast days which were shadowy sabbaths. “Speak unto the children of Israel, saying, In the seventh month, in the first day of the month, shall ye have a sabbath, a memorial of blowing of trumpets, an holy convocation” (Leviticus 23:24). Again we read, “Also on the tenth day of this seventh month there shall be a day of atonement ... It shall be unto you a sabbath of rest” (verses 27, 32). As you can clearly see, these annual sabbaths fell on a different day of the week every year, and God specifically explained that they were not to be confused with the weekly Sabbath. “These are the feasts of the Lord, which ye shall proclaim to be holy convocations, to offer an offering made by fire unto the Lord, a burnt offering, and a meat offering, a sacrifice, and drink offerings, everything upon his day: BESIDE THE SABBATHS OF THE LORD” (verses 37, 38). It is of more than passing interest that some of the most noted Bible commentators (including Adam Clarke and Albert Barnes) agree that Paul is not talking about the Ten Commandments being abolished at the cross. Dwight L. Moody, Dr. C. I. Schofield and Billy Graham also strongly affirm that the law abolished was the ceremonial law. Perhaps we should ask right at this point, what is the significance of the tables of God’s law being placed inside the ark of the covenant?Remember that this spot was the most holy on the earth because it represented God’s throne. God had said, “there I will meet with thee, and I will commune with thee from above the mercy seat, from between the cherubims” (Exodus 25:22). Below that shekinah glory, symbolizing the presence of God, lay that holy law by which sin was to be defined. And there, as we know from the Scriptures, Jesus, our High Priest, was to plead His blood for sinners. Think of it for a moment! This is the real thing from which all the Old Testament was patterned. Here is the real Priest, the real mediation, and IN THE ARK OF THE COVENANT, the real Ten Commandments. But please consider this horrendous scenario—IF THE LAW THAT WAS IN THE ARK WAS ABROGATED AT THE CROSS, CHRIST IS MEDIATING FOR THE TRANSGRESSION OF AN OBSOLETE LAW! Keep in mind that John is beholding this heavenly scene years and years after the cross. It is still there today! In the throne room of God, over the mercy seat, where His blood is now sprinkled for the blotting out of sin. Sin is still what it has ever been, and Christ ministers His blood for sin. No wonder the mercy seat is located just above the broken law. Remove the ark containing God’s law and you remove the foundation of His throne, His government. You also remove the law by which sin can be defined and judged. If there be no law, there can be no transgression, and therefore, no need of an Intercessor or a Saviour. With the heavenly sanctuary located so definitely in the throne room of God over the ark containing the Ten Commandments, there is not a shred of evidence remaining against the validity of that law. The truth is that all men will be judged on the basis of that eternal code which forms the foundation of God’s government. James wrote, “For whosoever shall keep the whole law and yet offend in one point, he is guilty of all. For he that said, Do not commit adultery, said also, Do not kill. Now if thou commit no adultery, yet if thou kill, thou art become a transgressor of the law. So speak ye, and so do, as they that shall be judged by the law of liberty” (James 2:10-12). Do not by any means miss the tremendous truths contained in these verses. This is the law we will be judged by! Which law is it? James leaves no room for doubt. He quotes two of the Ten Commandments. But notice how he defines this law as a complete unit in itself. He states that we are responsible for keeping “the whole law.” How many commandments are contained in “the whole law”? Exactly ten! What do we become if we break any one of the ten? “A transgressor of the law,” James answers. And that is what sin is called in the Bible. “Sin is the transgression of the law” (1 John 3:4). Is there any validity to the argument that the Ten Commandments were all abolished at the cross, and then nine of them restored in the New Testament? This is a specious invention to attempt evasion of the fourth commandment. No Christian has ever found fault with nine of the commandments. Why would they want to get rid of the fourth? Obviously because they are breaking it and do not want to believe that they stand condemned by it. Can they annul the entire decalogue, and then reinstate nine of them? We have proven already that only the mosaic law was annulled—not the Ten Commandments. Further, James has declared that the whole of that law is binding, and breaking any one of them is sin. How can anybody extract the fourth commandment from the Ten Commandments and still call it a “whole law”? Incidentally, the Sabbath is mentioned in the New Testament more than any of the other nine. This could be tied to the fact that God has apparently chosen the fourth commandment to be the great test issue in His law. In Exodus 16 He used the Seventh-day Sabbath to “prove them, whether they will walk in my law, or no” (Exodus 16:4). Is there reason to believe that the Sabbath contains a testing quality that cannot be found in any of the other nine commandments? It is an interesting question to contemplate. Besides being worded in a totally different manner (“remember” instead of “thou shalt not”), the fourth commandment is the one which does not have a stigma attached to breaking it. One might abstain from stealing for fear of going to jail, and from adultery for fear of getting shot by an angry spouse. In fact, it is illegal to break some of the Ten Commandments, so they might be obeyed simply to avoid the negative consequences of disobedience. BUT CONSIDER THIS: IN OUR WORLD TODAY, THE FOURTH COMMANDMENT ACTUALLY CARRIES A STIGMA FOR KEEPING IT! In fact, the only reason one would choose to obey it is out of love for Christ and choosing His will above our own. Therefore, it would constitute a special test of genuine love for Christ. Although there is a wealth of proof that the Ten-Commandment law and the Sabbath were confirmed by an obedient New Testament Church, I would like to focus on one area of evidence that is often overlooked or misinterpreted. We find it in Hebrews 4, and it probably constitutes the most convincing single reference in favor of Sabbath-keeping to be found in the Bible. As a little background, we need to examine the thrust of the whole book of Hebrews. The writer of this letter is showing how many of the elements of the old covenant have been taken away. We can almost feel the anguish of the Hebrew believers as Paul explains to them how the sacrificial system has been taken away, having been fulfilled in Christ. The Levitical priesthood has been removed, being replaced by Christ our High Priest. Were they waiting fearfully to hear him take away the Sabbath also? If so, they must have been tremendously relieved when he wrote these words, “There remaineth therefore a ‘keeping of the sabbath’ (see margin) to the people of God” (Hebrews 4:9). I am using the marginal reading of the King James Version because that is the exact, literal meaning of the original statement. The context of Hebrews three and four does not indicate that Paul was trying to convince the Hebrew Christians which day to keep holy. They already knew that. His great burden was for them to enter into a spiritual relationship with Christ—to have an experience of rest from the works of sin. He proved that the children of Israel did not find that true rest because of their lack of faith and disobedience in the wilderness. Although the Greek word for rest, KATAPAUSIS, means simply “cessation from work,” the context seems to indicate that the author is talking primarily about finding a spiritual rest in their experience. Nevertheless, the two chapters definitely tie the spiritual rest to the Seventh-day Sabbath-keeping initiated and commanded by God in the beginning. Otherwise, we would not find in verse four a direct quote from Genesis 2:2. “For he spake in a certain place of the seventh day on this wise, And God did rest the seventh day from all his works” (Hebrews 4:4). The big question about this verse focuses on the works which one ceases from. Are they works of sin? Are they works to obtain salvation? Or are they the physical works from which we cease on the Sabbath? The answer is plainly revealed by the phrase “AS GOD DID FROM HIS.” Go back to verse four and we begin to understand why this quote from Genesis is included in Paul’s discourse. It is necessary to establish which works God did rest from. God ceased from His physical work of creation on the seventh day, and we are admonished to cease from ours, as He did from His. He did not just enter into a spiritual rest on the seventh day or we might conclude that He was not at spiritual rest on the first six days. The fact is that God is always at spiritual rest. Neither did He have any works of sin or the flesh to cease from. He simply rested on the seventh day from His work of creation, and we are being told by Paul that the ones who truly have received the spiritual rest of salvation will ALSO cease from their physical works on the Sabbath, AS GOD DID FROM HIS. Don’t you see how this lends a tremendous new spiritual dimension to the keeping of the Sabbath? It memorializes our personal salvation experience. It stands as a blessed weekly reminder of the continual rest from sin that we may have through Christ. No wonder the Sabbath “remains” for the people of God! Our Creator has made it a symbol of the sweetest spiritual blessings available to the human family. We can understand why God did this when we pause to think how Sabbath-keeping parallels the salvation experience. What really makes something holy? In Isaiah 58:13 God calls the Sabbath “my holy day” and “a delight.” Listen! It is the presence of God in something which makes it holy. (Remember the burning bush?) God’s presence is in the Sabbath just as His presence is also manifest in the life of a genuine Christian. So why should not true Sabbath-keeping be made a memorial of true salvation in Christ? Lest someone raise the stale argument that the Sabbath is only a sign of holiness for the Jews, let me hasten to add this inspired text: “if ye be Christ’s, then are ye Abraham’s seed, and heirs according to the promise” (Galatians 3:29). All born-again Christians are the true Israel today, and have been sanctified unto God. therefore, the Sabbath is for them. This sign of sanctification has been reaffirmed in the New Testament by Paul’s dramatic statement in Hebrews 4:9, 10 that the keeping of the Sabbath remains for God’s people. Because we have entered into His spiritual rest of salvation (“Be ye holy”), he declares that we should ALSO rest from our works, “AS GOD DID FROM HIS” (“my holy day”). Someone might suggest that after we enter into spiritual rest there would be no need to observe the memorial of it by keeping the Sabbath physically. But if that were true, we would have to also stop practicing water baptism. Immersion memorializes our death to the old man of sin. We experience that conversion BEFORE entering the water to be baptized. If the physical observance is unnecessary just because we have had the spiritual symbolism fulfilled in us, then we should abandon the physical custom. Further, we would have to renounce the practice of celebrating the Lord’s Supper. It also memorializes an experience of the heart in receiving the sacrifice of our Lord by faith. But should we give up the physical observance of the communion just because we have already entered into the spiritual joy of what it represents? Of course not! Then why should anyone suggest that the Sabbath not be observed physically just because it is used as a memorial of union with Christ? Paul says that it REMAINS as a Sabbath rest for the people of God. 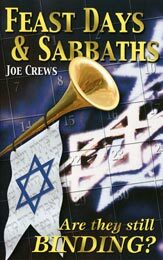 In their monumental Commentary On the Whole Bible, Jamieson, Fausset and Brown make this comment on Hebrews 4:9, “This verse indirectly establishes the obligation of the Sabbath still” (page 449). It is most interesting that these Sunday-keeping theological scholars, with the highest of linguistic credentials, make such a statement. Yet the relationship of the spiritual rest of salvation and the physical Sabbathkeeping is undeniable in the context. So how can we summarize our discoveries about the two laws? Surely it has been established that the Ten Commandments were in a different category than the temporary mosaic law of ordinances. That moral code, encased in the ark of testimony, like the rest of the wilderness sanctuary, was a copy of the true pattern in heaven. So we affirm that it not only was repeated and reinforced in the New Testament but was identified in John’s vision beneath the mercy seat in the heavenly sanctuary, from which Christ ministers His own blood for the transgression of that holy law. From that foundational position, it continues to be the basis for Christ’s intercessory ministry for us in the throne room of heaven. Therefore, it is established as the most unmovable and unchangeable of all God’s decrees.